There are a limited number of enzymes available to the food industry and chances are, if one food manufacturer is using them, then so are its competitors. To create competitive advantage and aid innovation there is a need for fast and cost-efficient access to novel and unique enzyme solutions. The process of taking a new enzyme from concept to routine manufacture has previously been an expensive and lengthy process, but Biocatalysts Ltd is continuously breaking down these barriers. Investing in new technology and introducing new capabilities has enabled Biocatalysts Ltd to achieve this. The latest addition is MetXtra™, a novel and unique enzyme discovery platform, which has further reduced the cost and time that it takes to identify, rationally select and produce novel enzyme samples for testing. MetXtra™ is a bioinformatics system for the rational and rapid identification of novel enzymes from large metagenomic DNA sequence libraries. This ultimately means that the food industry can now quickly and rationally discover unique enzymes for specific application parameters to aid innovation. MetXtra™ is an extremely exciting new capability for Biocatalysts Ltd and its customers. The multidisciplinary team of software engineers, bioinformaticians, biologists and chemists have developed something truly unique. MetXtra™ adds a new dimension to Biocatalysts Ltd’s expanding enzyme development and manufacturing capability and the company has already successfully used this proprietary system to discover novel enzymes for 5 multinational blue-chip companies within the food industry. Only a tiny fraction (~1%) of all microorganisms can currently be grown in the laboratory and hence have their DNA sequenced. Thus, there is a huge wealth of genetic sequence data still to be discovered from environmental samples of the remaining 99% of uncultured microorganisms. The field of metagenomics directly samples microorganisms living in the environment, thereby avoiding the need for laboratory culturing before DNA sequencing. Metagenomics projects can yield very large amounts of DNA sequence data and the major bottleneck to exploiting this data for enzyme discovery is the actual data analysis. 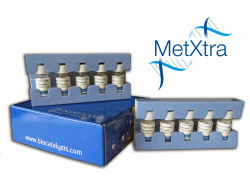 MetXtra™ has access to metagenomic libraries (including Biocatalysts’ own metagenomic library) with over 335 million protein sequences covering diverse environmental niches such as hot/cold, acid/alkaline and saline. That is a large amount of data to manually sort through. With support from Innovate UK, Biocatalysts Ltd has worked with The European Bioinformatics Institute (EMBL-EBI) to produce technology that will automatically search and analyse large datasets. This proprietary platform, MetXtra™, enables Biocatalysts Ltd to screen metagenomic libraries for enzymes in minutes rather than days. The results can also be filtered through numerous algorithms to refine the candidate enzyme list. Refinement encompasses customer specifications and requirements, such as solubility, capacity to be secreted, pH and temperature stability, so that the final set of candidate enzymes is targeted specifically to their needs. The customer receives a panel of research grade enzyme samples ready for testing on their application. This rational selection process ultimately gives fast, low cost access to enzymes with a higher probability of being commercially successful. Biocatalysts’ approach to providing panels of enzyme samples from metagenomic analysis is highly customer focused. We work with each individual customer to understand their specific requirements and specifications to then target our MetXtraTM platform to search our metagenomics libraries based upon these details. This provides a bespoke panel of enzyme samples with a higher chance of successfully delivering the required enzyme properties to the customer, ultimately de-risking the project. This service enables you to identify and test unique enzymes, that you previously wouldn’t be able to access, without a large investment of time or money. This allows you to innovate for emerging industry trends, get your new products to market quicker and gain competitive advantage within your industry. Download our case study to find out how we use MetXtra™ to discover new enzymes. Contact us to find out how our MetXtra™ Enzyme Discovery Platform can help you discover the best enzyme for your application.